Unnerving, dark and wicked. Music video from Depeche Mode features a car reversing through the night streets, knocking over people/bashing into cars, it’s depressing and morbid like a bad dream that you should refuse to watch. 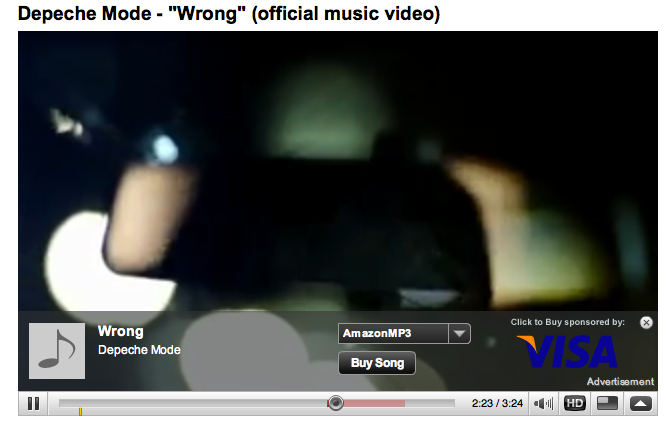 YouTube’s player featuring ‘buy this track’ overlay sponsored by Visa. That’s a familiar business model for Google to be pushing. Pay attention though, taking a user from a passive consumption model (watching) to active buying engagement (spending) can be a hurdle especially when music is so ubiquitously available. Yes. But then you can’t stop watching it.